Personalized sticky notes or self stick post it notes are one of the few ways you can keep your brand and contact information in front of clients, prospects and partners every day of the year. Everyone uses some form of writing surface, if you give an attractive personalized sticky note cube as a gift to your target market, you practically guarantee your brand and contact information will be seen every working day. Advertising and branding is all about multiple impressions at the lowest cost per impression. Personalized sticky notes provide one of the lowest costs per impression you can find. If your custom made sticky note, printed with your logo and contact information is on the desk of your target audience it will be seen over and over, day after day. Each time your personalized sticky notes are seen the cost per impression goes down. 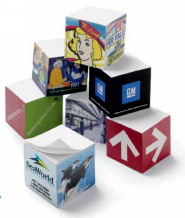 A custom sticky note cube or self stick post it note is a fantastic way to promote your business, not only can you create a high impact colorful promotion for your business you also provide the user with a useful and valuable desk top tool. A personalized sticky note is a continuous marketing tool that also provides the user with a usable writing surface for those important reminders. A personalized sticky note is a perfect gift for valued customers or a great giveaway to potential customers, if it looks good and works well your custom sticky note and, thus your brand, will find a permanent home on the desks of your target audience. Personalized sticky notes or post it notes are available in various shapes and sizes, in various color combinations, and at affordable price points. Personalized sticky notes are affordable and depending on specifications are available at a low cost. 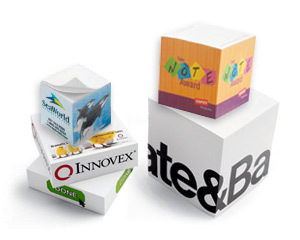 When you think about the value a custom sticky note cube provides as a business promotion and the value they provide to the end user, it's clear a personalized sticky note cube is one of the best ways to promote your business and keep you brand in full view each and everyday of the year. Decide which option is right for you, the sticky note cube or the post it note. For more information on personalized sticky notes and how they can help you grow your business request a sample or request a quote today.